Representatives from Adventure Travel Norway, Hvitserk AS, Contrast Adventure, Discover Norway, Outdoorlife Norway, Kayak the Fjords, Troll Aktiv, XXLofoten and Bergen Basecamp spend the week meeting with representatives of the North American travel trade through a series of interactive workshops in both San Francisco and Seattle. 22 North American adventure travel buyers came out to meet with the Norwegian suppliers, with several flying in from out of state just to participate in the meetings. Participating companies included iconic American tour operators such as Backroads, Borton Overseas, Geographic Expeditions, Natural Habitat Adventures, Zegrahm Expeditions and TCS World Travel. In addition to meeting with potential buyers, the Norwegian suppliers spent two days in a classroom style setting being educated by industry experts from the Adventure Travel Trade Association (ATTA), Wilderness Travel and Pandion Consulting. Working with the ATTA, Innovation Norway also organized a series of evening networking events to attract members of the local adventure trade trade communities. Between San Francisco and Seattle, over 120 local industry stakeholders came out to meet the Norwegian companies and in San Francisco, Norwegian Consul Jo Sletbak spoke brilliantly on the growing potential of Norway both as a travel destination and its growing influence in other sectors. 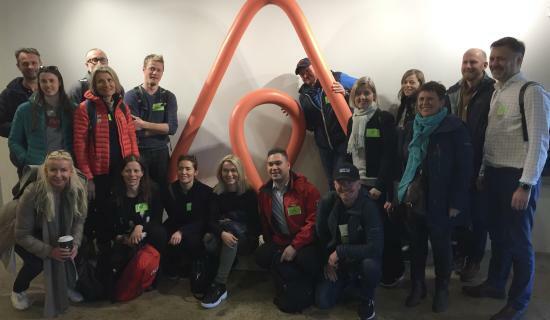 While in San Francisco, the group was invited to the headquarters of AirBnB to discuss the company&apos;s new "AirBnB Experiences" program and how we could work together to curate AirBnB&apos;s new line of Norway based multi-day adventure experiences that will be bookable through the AirBnB platform later this year. Several of the Norwegian suppliers are already creating unique experiences to be offered through this new channel. The West Coast program follows a New York program that took place during the second half of 2018 as well as several Oslo-based events that have taken place during the past six months. The Global Growth program will formally conclude in Oslo next month. Adventure travel is defined as a travel experience that involves nature, culture and different and unique experiences. It is the desire to experience something that challenges and gives something back (transformative experiences), and where travelers can get the feeling of having a positive influence. With over 6.1 million active adventure travelers, and an increasing interest and need for more active and enriching experiences, the potential for Norway within the adventure travel segment in North America is enormous. Norway is seen as an attractive destination based on our breathtaking nature, but also because it is easy to combine nature with culture, history, architecture and good dining experiences (culinary experiences is an increasing trend). American adventure travelers spend a significant amount on travel when going to Norway (about NOK 1,850 excl. flights) and stay for a week+ on average. Innovation Norway has been working actively with the Adventure Travel Trade Association (ATTA) since 2006. ATTA has 1,300 members (60% are tour operators) in 100 countries who all share the interest and passion for adventure travel and sustainable development of the adventure industry. Through targeted investments of time and resources into the network of ATTA, building on strong personal contacts and relationships, and participation in conferences and sponsorship with the visibility of Norway and Norwegian adventure products - we have built up a good position and knowledge for Norway within this industry. This is long-term work and it takes time to build up a favorable position, but over the last 13 years Norway has grown from a seventh place to a fourth place on the renowned Adventure Travel Development Index (ADTI). This index measures the potential of destinations and readyness to compete in global adventure travel markets. Norway has a clear advantage in our proximity to nature, relatively short distances and good infrastructure. But we have a challenge in terms of delivering good enough package solutions, and making it easy for operators and travel agent agents to sell adventure trips to Norway. This is something we work actively with, both locally in Norway and in the USA. The Global Growth Adventure program is one of many programs and activities that will help increase the insight and knowledge of the market and this segment among Norwegian business and industry. In addition to active processing of the network, continuous contact with adventure operators and providers, we have annually had one or two FAM trips to Norway to showcase Norwegian adventure products in cooperation with the industry at home. This has proved very fruitful, as we now see many more trips being produced to Norway, and several operators who have previously sat on the fence, produce programs for Norway. Visibility in the market is very important, and we need to make it easy for operators to both choose and sell Norway. In addition to having marketed Norway through various campaigns as a unique adventure destination, we have been present annually at both Elevate (the North American ATTA conference), and the Adventure Travel World Summit (the global conference that attracts 7-800 participants), and hosted local Adventure Connect networking events in several cities. We also invite adventure operators to come to our workshops, which are held annually in 2-3 North American cities. Please contact Hege Barnes or David DiGregorio in the New York office for more. Hege is Market Specialist, Visit Norway, for Innovation Norway USA - New York.